The majority of translators working in Germany are freelancers. In fact, a massive 87 percent of members of the German Federal Association of Interpreters and Translators (BDÜ) based in Baden-Württemberg work on a freelance basis. But why is that? One reason for this figure being so high has to be the sheer lack of in-house positions within the industry. If translators want to make a living from their craft, freelancing is very often the only option open to them. And, you know, it’s not a bad option at all … A freelancer can (in theory) become a digital nomad and sit working on their laptop at any beach bar in the entire world. Not to mention that they can earn a decent wage and be their own boss while they’re there. So why would you want to trade all that in for a traditional nine-to-five job? Once you’ve had a taste of the freedom that comes with being self-employed, it’s highly likely that you will soon find the idea of going back to being someone’s employee preposterous. And that was the way I felt too for a long time. Having worked as a project manager at a translation agency for several years, I decided to take the leap and go freelance in Ulm at the start of 2014. I had planned out every last detail and was feeling ready and highly motivated. When, three years later, I moved to Freiburg for family reasons, it just so happened that there was a vacancy for a position on the Peschel Communications team. After some brief hesitation, I decided to step back into the world of employment and join the team of in-house translators here in April last year. 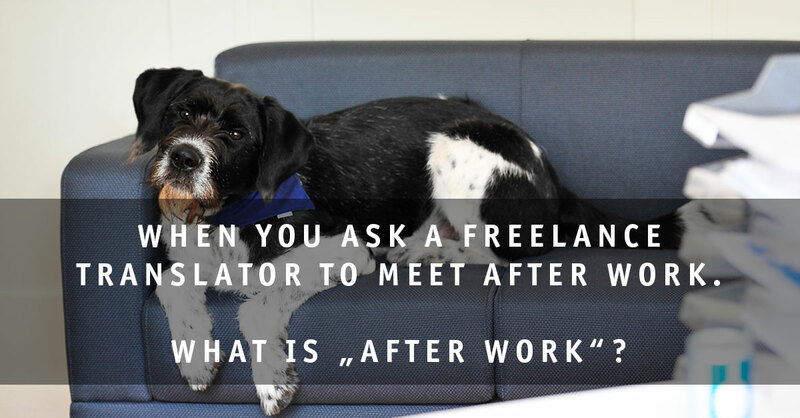 With my previous experience as a freelancer and my current position as an in-house translator, I am fully aware of the pros and cons of both ways of working. If you work on a freelance basis, you have to think about things like health insurance and pensions: What protection is available to compensate, say, for loss of earnings in the case of long-term sickness? Which pension options are there to choose from? And that’s not all, as suddenly you have a whole list of other important points to consider: What happens if a brochure has to be reprinted because something was wrong with the translation? Is there some kind of insurance to cover this? Before you can even get to that sort of concern, though, you’ve got to deal with all the basic questions you’re faced with before starting out: Do you have to register somewhere as being self-employed? Do you need some kind of business licence? Do you now have to submit a tax return? And, if yes, what does that involve? What happens about VAT? Obviously, you don’t have to concern yourself with any of these worries and doubts when you’re employed by someone else. Yet freelancers in the translation industry also have to get to grips with all sorts of other work that you wouldn’t immediately associate with the job of a translator. You’re suddenly faced with the challenge of finding customers, calculating prices, drawing up quotations, sending invoices and archiving documents – at least if you want to make sure there’s some money coming into your account at the end of the month. There’s no fixed salary coming your way on a regular basis. Plus, you’ve got to remember that the world doesn’t immediately know that you’re now working as a freelance translator. So it’s down to you to shout about it through marketing efforts, your own website and social media – all of which are part of your working day from the word go. And the chances are that none of this was covered on your translation degree course, leaving you to now muster up the motivation, ambition and initiative to learn everything you need to know. Not forgetting that dash of creativity and perseverance that will prove crucial now too. Basically what I’m trying to say is that freelance translators are also entrepreneurs. This also involves not being afraid to make some investments, for example. A CAT tool will currently set you back a few hundred pounds or euros, but there’s no getting round it if you want to work as a professional specialist translator these days. Plus, you’ll have to keep making sure that your licences and software are up to date. And you’ll have to do a lot more than just stay on top of the technology. If you want to survive on the market, you’ll need some expert knowledge too. As you become more familiar with a certain field, you’ll find that you can tackle your work with more ease and speed. Once you’re clued up, you’ll also be in a position to communicate much more easily with the customer (who will often enough be the author of the text for translation) and perhaps even point out errors spotted within the content of the source text. This is one way of building up trust, which is something that can never be valued highly enough when it comes to developing relationships with customers. Fancy popping out for a quick coffee in town? Well, that’s no problem at all if you’re a freelancer. If your translation isn’t due until first thing tomorrow, you can just finish it in the evening. Spotted that there’s a good deal on flights to Argentina at the moment? That’s absolutely perfect because, as a freelancer, you don’t have to get your holiday dates approved by anyone. Just book your tickets and you’re off! If you’re self-employed, you will get to indulge in levels of freedom that people in employment can usually only dream of. Of course, there is a downside to all of this flexibility. It’s a common stereotype that freelancers work all the time. And there is some truth behind this. After all, there’s always something to be done – whether it’s just filing or coming up with ideas for the rebranding of your website. Calling it a day is no mean feat – especially when you’re working from a home office. As the boundaries between work and home become more and more blurred, you can find yourself under a lot of stress and pressure. And then we mustn’t forget that famous lack of will power and control. If you don’t have to leave the house at half past seven in the morning to go to work, you have to have a lot of self-discipline to make sure you are sitting at your desk at home by a certain time. Then once you’ve pulled yourself together, it’s difficult to stay motivated and not get distracted by literally everything around you when you don’t have the ‘social control’ and working atmosphere of an office to keep you in line. If you’re surrounded by other people in an office space every morning, it’s less likely that you’ll end up wasting half an hour reading the newspaper. Just hearing your colleagues tapping away busily at their keyboards is usually enough to stop that from happening. And then when the office shuts up shop at 18:00, it’s time for all the employees to go home and enjoy an evening off. Fridays are even better as they signal the start of a whole weekend free from work. This is a concept that is alien to many freelancers. Paid holidays are obviously something that freelancers don’t get to benefit from and learning to really switch off is a challenge at the beginning of a freelance career. I remember being kept up all night with doubts running through my mind: Will my customers forget about me if I go away for a while? Should I check my emails every so often even though I’ve got an automatic out of office message set up? What happens if there are any queries about that last translation I delivered before going away? And couldn’t I just quickly take care of this short proofreading job on my laptop this evening? In the digital age, it’s all too tempting to check our smartphones constantly – even when we’re at the Río de la Plata. Sometimes, a holiday might then even end up turning into a business trip before you know it. Whilst freelance translators can more or less do whatever they please at their desks at home, employees based in an office have to be considerate of those around them. Listening to loud music, taking personal phone calls and checking private email accounts are generally frowned upon. Then there’s the fact that an employee’s working day is mapped out much more strictly. Finishing a translation late could completely ruin the schedules of the colleagues responsible for revision. Having said that, as an in-house translator, you’re free to focus all of your attention on the text you’re working on. Other tasks, such as project management and social media marketing, simply don’t fall under your remit. In an office filled with multiple employees, you won’t get a say on the technology used either. You won’t be able to decide which CAT tool you use and you’ll have to follow the strict rules in place for terminology management to ensure that a carefully organised system doesn’t end up descending into a chaotic mass of data. Freelancers, by contrast, are usually free to select the CAT tool they work with and they can also define the system they follow for adding individual terms to their terminology database. It’s down to them if this results in a logical structure or a right muddle. Yet there’s no denying that working in a team comes with some huge advantages. I can quickly ask a British native speaker in the office how they understand a complicated sentence in an English contract or ask a colleague for help with a CAT tool problem. When I was a freelancer, I would have had to struggle to get support via email or over the phone. But now, I can get these things sorted in a matter of minutes here in the office. However, my colleagues don’t just help me out with tricky bits in the source text or technical problems that I can’t deal with myself. When it comes to polishing up a completed translation or correcting any errors that may have slipped in, you can’t put a price on working directly as part of a team. Given that every single translator will take a different approach to the same text, the only way to learn is by talking through the corrections made. Not to mention that the objective eye of the reviser often sees so much more than that of the translator – especially when they’ve been working away on something for days or even weeks and can no longer see the wood for the trees. Communicating one-on-one with colleagues is a huge asset, helping to avoid that phenomenon of translators being left to ‘stew in their own juice’ (at least to a certain extent), which freelancers working in home offices have to be much more proactive about. Whether you choose to work as a freelancer or an in-house translator, there are pros and cons all round. In my experience, the way in which you deal with the specific challenges that come with your day-to-day working situation ultimately depends on the type of person you are. If you ask me, there’s no blanket answer that one route is ‘better’ or ‘worse’ than the other. As much as I enjoyed the independence and freedom that came with being a freelancer (and considering that I worked through a lot of weekends), I now really appreciate my set working hours and, above all, I love working with my colleagues here at Peschel Communications.